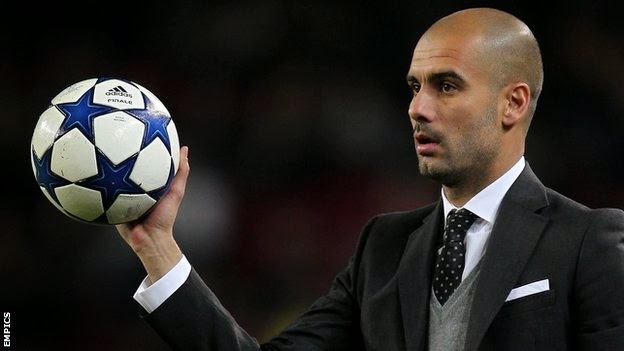 Just as a prince inherits a kingdom, the Bayern Munich team Pep Guardiola inherited from Jupp Heynckes was a football empire.Three champions league finals in succession, the bundesliga title weapped up in record time, this was a team that was destined to rival the barcelona team under guardiola, the one known as the best team ever. Although destined, they may have just fallen short of proving it. When the season kicked off, anyone who suggested Bayern were on course to be the first team to successfully defend the champions league crown would not be seen as crazy, probably not seen at all, just one in the crowd. Guardiola was believed to be the man who would lead a team through this endeavour, the man who is more of a philosopher in football more than a manager. Tiki-Taka, more than just a football style to Guardiola, it is an art. The key to this play style is short, neat passing, possession greater than shots on goal. This concept was key to Barcelona's dominance under Guardiola, teams struggled to crack it, and this was believed to be the key that would open the chest that hid the European treasure. The shortcomings of this philosophy was first exposed when Bayern struggled to open up a Manchester United side coming 7th in their domestic league. The whole of the match was Bayern passing the ball side to side, never finding the killer pass to gut the English side's defence. when the next leg at the Alianz Arena was played, it was thought Bayern would play more free, but it was much more of the same. United scored the opener again, but Bayern cancelled Evra's strike out instantly, and scored another 2 to win the match. Although an impressive scoreline, United's lapse in concentration was more to blame than Bayern's killer instinct. 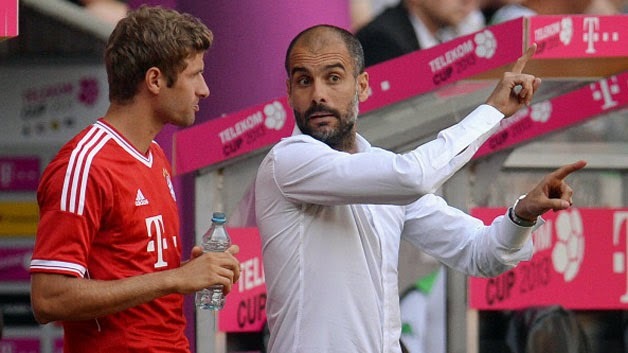 Bayern legend Franz Beckenbeaur openly criticized Guardiola's tactics, challenging him to play more 'entertaining' football. In between the quarter finals and semi finals of the champions league, Bayern won a successive Bundesliga in record time. A joyous moment for the Bavarians, the next results were not as joyous; 3 wins, 3 losses and 2 draws. Meanwhile, their opponents in white entered the match-up on the back of an El Classico title fight TKO of Barcelona. In the fixture, Bayern held majority of the ball, many more passes, and more shots, but it was Madrid that had the top host of chances, could have easily won 3-0 due to misses from Ronaldo and Di Maria. Instead of admiting his tactics were wrong, Guardiola praised his side after the defeat, expressing how his gameplan was executed to perfection. Then came the second leg, Lahm was reverted back to his usual right back position,but no defensive midfielder was started, with the holding midfielders being the less-than-mobile pairing of Kroos and Schweinsteiger. As the ball was kicked off, it became inevitible that Bayern resided to their old and tired tactics of the first leg, and they paid a price. Madrid took the lead in 16 minutes of a set-piece thanks to Sergio Ramos, then the same man doubled the advantage. The 2013 Ballon D'or winner then joined the party, adding a brace. While the over-excessive passes are to blame for the lack of goals scored, the philosophy taught by Pep is among a number of problems with this German side. While there was a goal drought in Bayern's attacking third, goals were in bloom at their goals. With both fullbacks up the other end in the form of Alaba and Lahm performing overlapping runs, Dante and Boateng were left exposed. The high line executed by last season's treble winners with Boateng and Dante halfway up the field resulted in them failing to handle the Madrid onslaught. With the central midfield pairing of Kroos and Schweinsteiger, there was no armor defending the achiles heel of bayern. In both legs the Bavarians needed a screener in front of the defence, and they have a mroe than qualified player in that position in Javi Martinez who was warming the bench. One of the keys of last season's treble winning side was he would sit in front of the back four, stopping any counter-attacking threats, and his presence may have prevented Madrid's attacks. Other War-Heroes of last season's European campaign have also struggled to adapt and make as much of an impact to the side, players such as the Bayern youth product Thomas Muller. last year, Muller was a space shuttle, entering space, making runs into areas no one else would see and this opened up the hearts of defences. Now though, his free-running ability has been restricted as the ball is passed side-to-side, the killer ball not as common as last season. As much as Guardiola's art of tiki-taka was hailed in Spain for transforming Barcelona into the powerhouse it is today and laying a solid foundation for them, ot clearly doesn't suit this Bayern team, and has led to them taking a step back compared to Jupp Heynckes side of last year. This philosophy may work in the bundesliga against lesser sides, but in Europe it has left them with no end-product, so now Guardiola has a huge task to change his style to accommodate this record-breaking side.